“A spiral of kaleidoscopic colours coalesced in the void, a violent outburst of warp energies exploding forth into real space. It grew with surprising rapidity until vomiting out a monolithic conglomeration of spaceships of varying origins, some of human construction, many more of a distinctly xenos design and all fused together by the insane vagaries of the immaterium. With the warp rift closing behind and multi-coloured tendrils of impossible light bleeding from its surface, it drifted silently amongst the stars with anything but stately grace. Panic took hold of the whole sub-sector as the space hulk, codenamed ‘Lugubrious Ruin’, gravitated toward the human inhabited planets. Desperate calls for aid were sent by astropathic communication, pleading for assistance from the administratum. The first sign that any notice had been taken of these petitions came in the form of a sleek and deadly battlebarge, bedecked in the grey and gold livery of the Iron Eagles space marines. It has been a long time coming, as I’ve had these models assembled and undercoated for quite a few years but never got around to painting them. 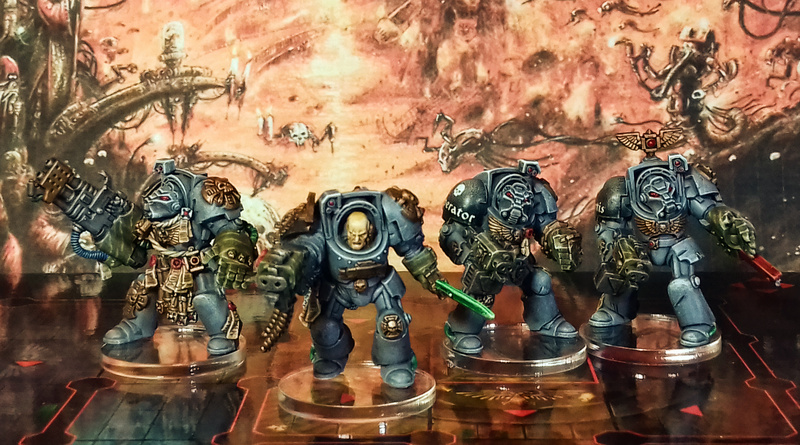 I made a commitment to myself to get my Space Hulk collection painted by the end of 2017 and I have been doing the marines in small batches throughout the year. 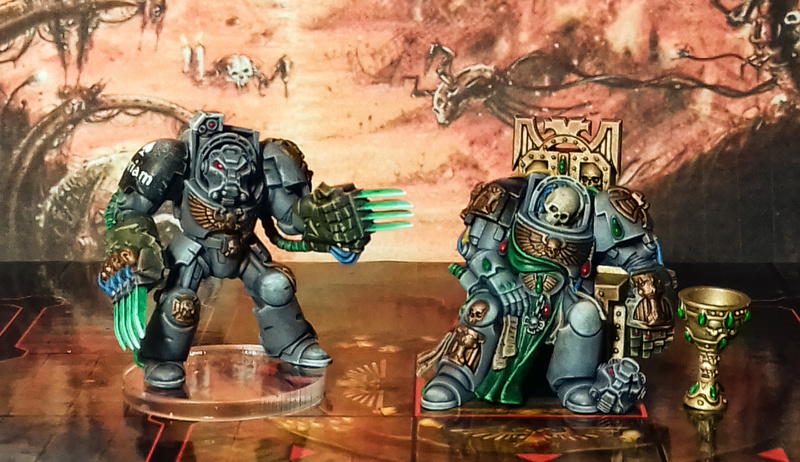 I’ve only got the librarian and another basic terminator to do before I take on the chitinous hordes of genestealers! 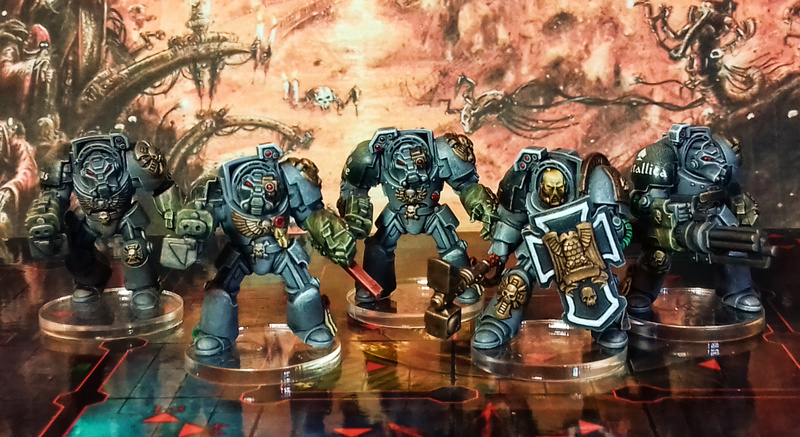 As I mentioned in an earlier post, these are not the original miniatures (except the deceased marine of course), but I was never a big fan of the minis from the boxed set anyway and prefer my own personalised ones. These guys look awesome, and the background is very effective. Are they ‘standing’ on a TV/monitor that’s showing a map, or is that cardboard under plexiglas? Thank you mr. Arkie! It’s actually a board from the assassin game by Games Workshop, it has very high gloss finish.